Although the first dental laser was designed back in the 1960s, it wasn’t until recently that it began to be implemented more regularly in dental treatment. It might sound like science fiction, but laser dentistry can be quite beneficial for a variety of reasons. Today, we’re going to dive into the benefits of laser dentistry so you can see if it’s a good fit for you. 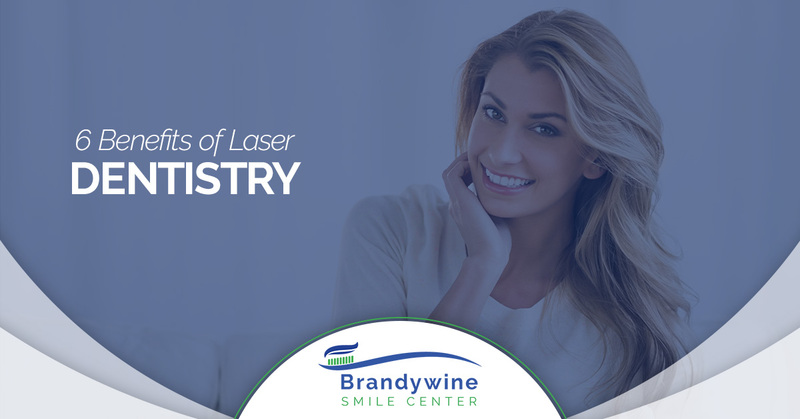 If you would like to learn more about laser dentistry, call Brandywine Smile Center today. We’ll be more than happy to answer any of your questions. The tissue within our mouths is quite sensitive and needs to be handled carefully so as to not damage it. Traditional dentistry methods can be harsh and rely on a steady hand to be effective. Laser dentistry is incredibly precise, making cuts more conservative than is possible with traditional methods. This causes less damage to the surrounding tissue within your mouth while reducing the amount of swelling following a procedure. 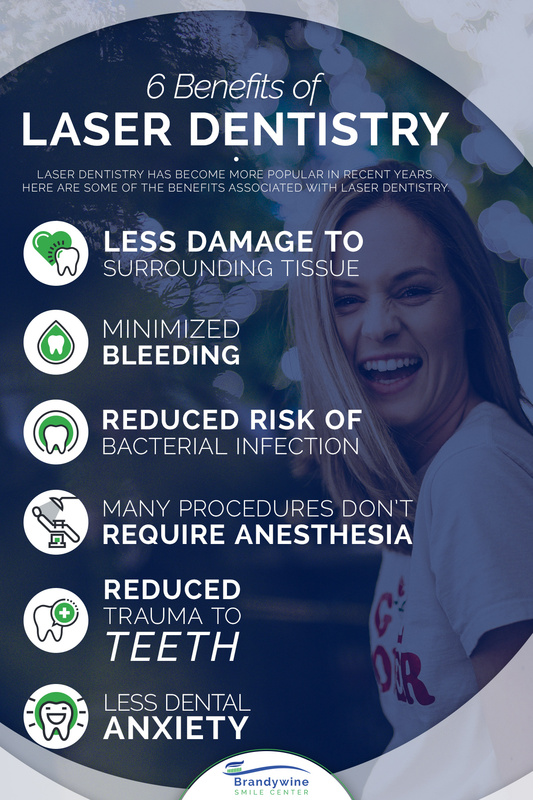 That means that dental lasers can be used to remove tooth decay and treat bone and gum tissue while preserving the natural composition of the teeth and gums. Thanks to the precision provided by its highly concentrated beam, dental lasers are able to keep the treatment area small. It is also able to promote the coagulation of blood vessels during the procedure, making any bleeding much more minimal than with traditional methods. This likewise reduces the amount of swelling following treatment, which many people find uncomfortable. One of the biggest benefits of laser dentistry is its ability to sterilize the treatment area. Our mouths contain a lot of bacteria, even when we diligently brush our teeth. When we have a treatment done within our mouths, there is a potential for bacteria to enter the treatment area, which can then cause an infection. Of course, traditional dentistry does what it can to mitigate this potential with sterilized tools, but a dental laser is able to sterilize the area itself, helping to reduce the overall risk of bacterial infection. The nature of dental lasers means that they’re able to operate without the use of heat, pressure, or constant vibration. That means that many procedures that would otherwise be quite painful are now performed completely without pain. While some procedures still require anesthesia, it is most often a topical anesthetic used only to avoid sensitivity resulting from the use of the water spray. No longer will you have to leave an appointment with numb lips or tongue. Just as a dental laser is able to reduce damage to tissue, it is also able to avoid damaging the teeth itself. When a high-speed drill is utilized in dental work, it can cause occasional hairline cracks in the surface of a tooth during a procedure. Because laser dentistry is able to avoid this, the risk of needing future dental work because of those small fractures is also reduced. This makes it an ideal option for treating everything from periodontal disease to root canals. It can also be used to prepare a tooth with a cavity for a filling. Many people have a fear of going to the dentist. Whether it’s caused by a fear of pain or something else, they often point to one thing that can trigger their odontophobia — the sound of a drill. The high-pitched whirring whine of a dental drill can cause people a great deal of anxiety, so by undergoing laser dentistry treatment, it can help someone avoid those fearful feelings. The lack of sound, pain, discomfort, and trauma all make laser dentistry a great option for people with dental phobias. Laser dentistry is constantly evolving and improving to become a beneficial treatment option. With the benefits we’ve discussed today, we hope you’ll consider it for your next procedure. If you have any further questions, please don’t hesitate to call us at Brandywine Smile Center. Located here in Glen Mills, we’re proud to provide fantastic dental treatment to our community. Whether you are just looking to get a routine cleaning or you need cosmetic dentistry treatment, we will be happy to help. We hope to hear from you soon.